Lucie Audio is a boutique audio equipment manufacturer based in Melbourne, Australia. The work of a small but dedicated team, focused on bringing a vision of what a modern stereo sound system could be and do, to market. Lucie blends state of the art technology both developed in house and sourced from key partners, with a hands-on and meticulous construction and finishing process. We believe the results speak for themselves, and our aim is to promote a renewed emotional response and engagement with music. Innovative technology blended with sound fundamentals. The goal of Lucie is to revitalise an interest in good sound reproduction at home, by bringing the music front and centre, rather than the equipment. Though we use some cutting edge technology, once it is working on our side it can become transparent, leaving a new level of enjoyment - first and foremost good sound reproduction should forge a deeper connection to the music we love. The technical foundations of Lucie lie in room correction and efficient amplification, and their liberation in getting the best out of what could be considered unconventional loudspeaker designs. 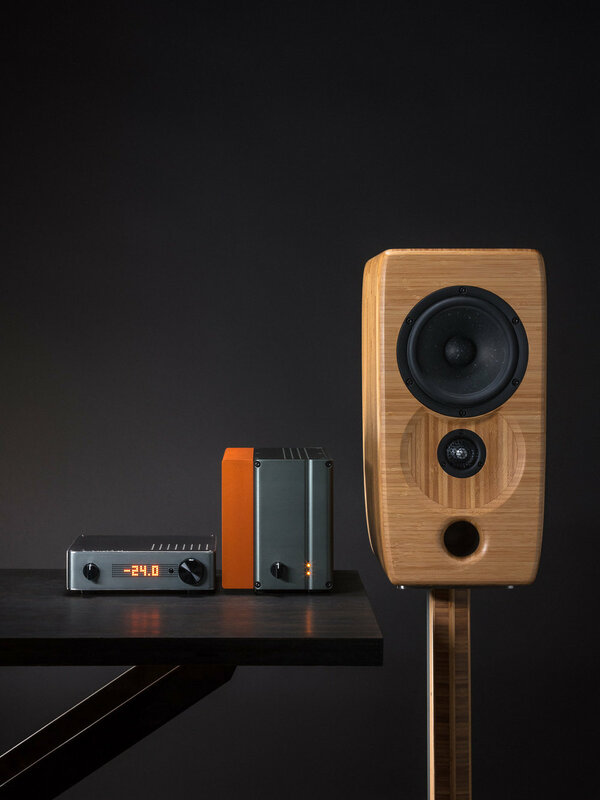 Central to this is the premise that most commercially available hi-fi speaker designs are based on a series of assumptions - about your tonal preferences and the characteristics of your listening space, which are only by occasional chance completely accurate. The uncomfortable fact in sound reproduction is that the listening environment is so often the deciding factor in overall enjoyment of the system, and it is a topic that is seldom addressed when choosing one piece of equipment over another. The use of DSP (Digital Signal Processing) allows great flexibility here - to achieve the best possible result in terms of tonal balance, depth and width of soundstage, and accurate presentation of instruments and voices, we tune the system and the room as a whole. The architecture of the system is chosen for maximum versatility - the core of Lucie is our pre-amplifier/processor. Through the on-board DSP, we have access to vast capabilities for tuning the sound system to your space. Digital crossovers, room correction filters through the Dirac Live® room correction system and precise multi-channel signal level control are all handled here. With options for analog or digital input from a variety of sources and volume controlled analog output, this becomes the heart of our active audio system. From there we can either connect a huge variety of existing traditional amplifiers and loudspeakers, or pair with our own ultra high performance Hypex Ncore® powered amplifiers and unique loudspeaker designs.